Geranium (pelargonium) is an undemanding plant that can bloom almost all year round. It is decorated with balconies and flower beds in the garden. It feels great on the windowsill. Geranium is a natural antiseptic and cleans the air in the home from harmful germs. After wintering on the windowsill, as if a flower grew, then seat it. The transplanting and cuttings of the geraniums held in late February-early March. But if pelargonium abundantly salustius, produce remove it from cuttings at any time of the year. Cut the cuttings from an old Bush on the bias. Do this procedure with a sharp knife. Carefully remove with escape the buds, if any. Leave 4-6 leaves. The lower leaves of the cutting to remove. Do not save the old plant, it flowered in the new season will be ugly. Put the cuttings on the paper towel in a dark place for a couple of hours. The cut should podelitsya. To root cuttings in several ways. First method: put the cuttings in a glass of water. After three weeks, the geranium will give the roots. It can be transplanted into a pot. Second method: pour into a small container of peat and sand in equal proportions. Deep stick, this mixture was dried in air stalk. Occasionally watering, as the drying of the soil. After three weeks transplant pelargonium, along with a clod of earth, in prepared soil in a normal pot. The third way: stick the cuttings slanting cut in the damp sand. Two days, sprinkle water on the sand from the dispenser. Then plant the cutting in a pot with soil. Prepare the pots for new cuttings of geraniums. Capacitance should be small, then the geraniums will bloom profusely, and not to let new green leaves. Rinse the pots in a weak solution of potassium permanganate. Thoroughly rinse with water and dry. Make special soil substrate. Mix equal proportions of the cespitose earth, peat, sand and humus. Add a bit of clay. 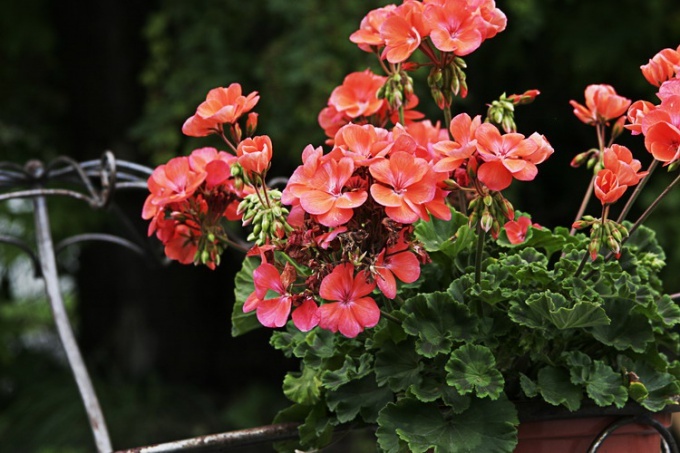 Land for geraniums should be dry, and the plant may rot. Plant rooted cuttings into the prepared pots. Geraniums love sunlight, but not direct rays. Protect plants from drafts. Do not spray with water. Pinch young cuttings to pelargonium equally developed and formed lateral shoots.